Mutations in tumor suppressor genes, such as TP53, and oncogenes such as H-Ras account for the development of a large variety of cancers. Mutations in two gene groups, tumor suppressors and oncogenes, play an important role in inducing and promoting a large variety of cancers. Oncogenes tend to encode growth factors, growth factor receptors, cell signaling proteins and transcription factors, while tumor suppressor genes encode cell cycle regulators. Most oncogenes are activated via point mutations, gene amplifications and gene translocations in a normal gene known as proto-oncogene and result in altered gene expression or protein activity levels (Lodish et al. 2000). In contrast to oncogenes, mutant tumor suppressor genes are recessive. They follow the Knudson or “multiple-hit hypothesis”, which suggest that both alleles of a gene need to be mutated in order to trigger disease onset. In spite of this hypothesis, the inheritance of certain mutant tumor suppressor alleles, such as BRCA1 and BRCA2 mutant alleles, significantly increase the risk of developing breast and ovarian cancers. For example a female carrying a mutant BRCA1 allele has a 60-90% lifetime risk of developing breast and a 40-60% risk of developing ovarian cancer (NHS UK). In light of these increased risks predictive genetic testing for BRCA1, BRCA2, TP53 and PTEN mutations are available for those who have a family history of early onset breast cancer. 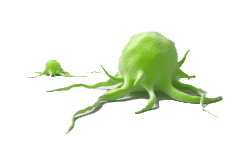 Bio-Rad offers a variety of antibodies for the analysis of tumor suppressors by ELISA, Flow Cytometry, Immunofluorescence, Immunohistochemistry, Immunoprecipitation and Western Blotting. For more information on the most widely studied tumor suppressor, visit the p53 page. You will learn about p53 structure and different isoforms and get practical advice on detecting p53 in western blot, flow cytometry and IHC experiments. Western blot analysis of whole cell lysates probed with anti-p53 antibody (VMA00019K) followed by detection with HRP conjugated Goat anti Mouse IgG (1/10,000, STAR207P) and visualized on the ChemiDoc MP with 2 second exposure. The arrow points to the p53 protein (molecular weight 53 kDa). 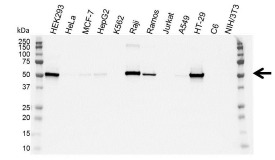 The anti-p53 antibody (VMA00019K) is part of the PrecisionAb range and has been extensively validated in Western Blotting. PrecisionAb products are characterized by their high specificity, high sensitivity and batch to batch consistency (every lot of antibody meets the same strict quality control criteria). For more information, check our PrecisionAb range. NHS UK. Predictive gene tests for cancer risk genes. https://www.nhs.uk/conditions/predictive-genetic-tests-cancer/, accessed June 08, 2015.